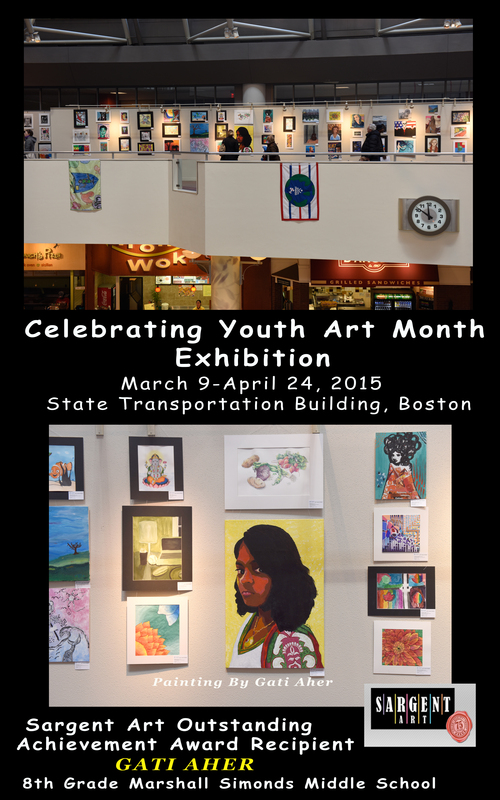 The 2015 Youth Art Month family celebration, sponsored by the Mass. Art Educators Association, was held on Sunday, March 22nd at the State Transportation Building in Boston. Students from 63 school districts throughout Massachusetts in Grades K-8 were selected by their art teachers to exhibit work (each educator was limited to just 5 pieces of artwork, including Ms. Phillips’ art classes and Ms. Rogers’ Photo Clubbers ). Congratulations to all students whose work was selected for the exhibit. Special recognition goes to Marshall Simonds 8th grader, Gati Aher, who was selected for the Sargent Art Oustanding Achievement Award for her cultural self-portrait. Gati’s prize package includes an all-expense paid trip for her and a parent (AND her art teacher) to NYC, including airfare, hotel, transportation, and museum visits. The other nine MSMS student artists included Alison Martin, Erin Kerr, Angela Minichiello, Nicole Keddy, Analicia Padilla, Neil Pandit, Sarah Owens, Abby Fennell and Madison Green. Ms. Rogers and I want to extend our thanks to all the parents who attended the family celebration to support their children and the visual arts.